TwelveTwoTimes: But I didn't like it. "But I didn't like it." Kanyon's first words after I discovered this giant mess he made while we was supposed to be taking a nap. All the time he was supposed to be sleeping I heard some funny sounds but I never went to investigate. I only saw the mess when he come out of his room to go to the bathroom. 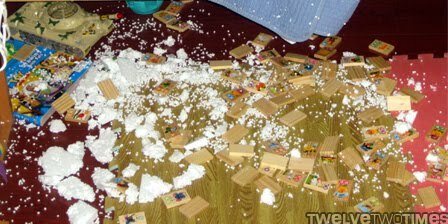 The little Styrofoam balls were stuck to everything: bed sheets, toys, books, dominoes. We still find them everywhere a week after the event. M'Lynn came home during the middle of the clean up process. She stopped with her mouth open, "That's a bad choice! That's a big bad choice." Then she went to the bathroom and left the apartment back to her board game leaving me alone to clean up the mess.